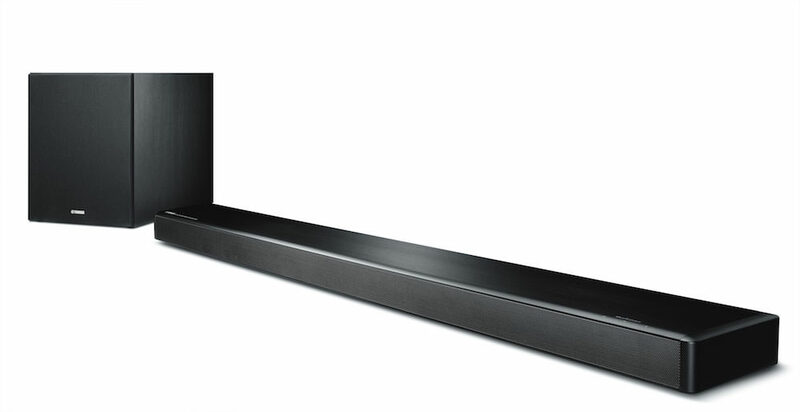 Yamaha today announced the YSP-2700 MusicCast Sound Bar with Wireless Subwoofer that delivers true 7.1-channel surround sound with remarkable presence, detail and clarity, plus the freedom afforded by wireless multiroom audio streaming. It replaces the YSP-2500 sound bar I reviewed last year, but costs $200 more for extra features and potentially a bigger, better soundstage. 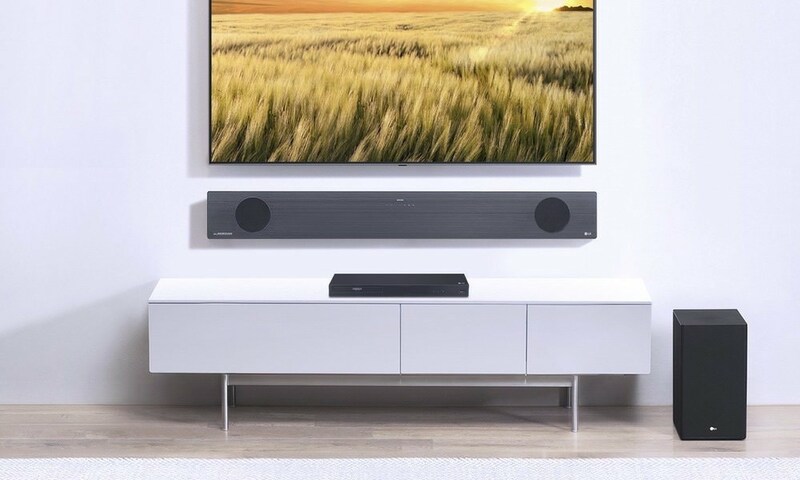 The sound bar itself looks the same and has same speaker driver array, but the subwoofer looks bigger, MusicCast multi-room wireless streaming has been added, and the HDMI ports now pass-thru HDR and 4K (YCbCr=4:4:4). 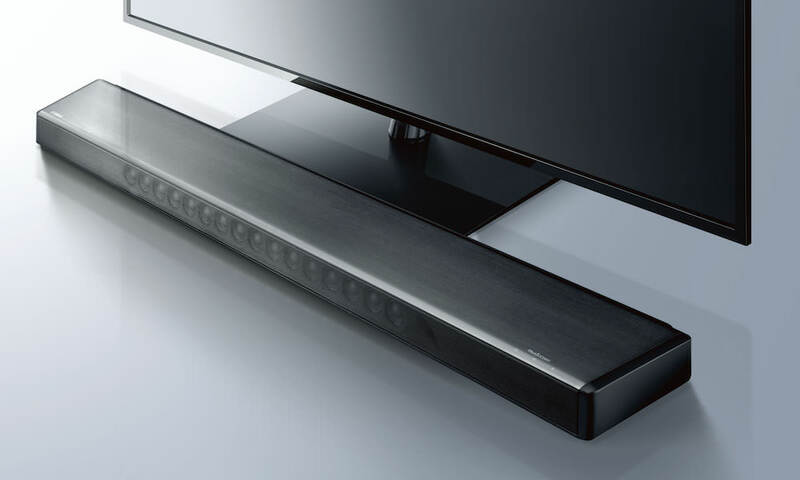 Unusual in this product category, the $1200 sound bar draws its true 7.1-channel capability from Yamaha Digital Sound Projector technology. This unique sound bar utilizes 16 speakers, each powered by a 2-Watt amplifier, to produce discrete sound beams that reflect off the walls of a room to envelope the listener from multiple directions. Each speaker is engineered with unique Yamaha craftsmanship to present dynamic presence, clarity and detail for a rich, lifelike aural experience. The cube-style, floor-positioned wireless subwoofer claims to provide heart-thumping bottom and rumble. The YSP-2700 also incorporates Yamaha MusicCast, a new way to bring music to every room in a home wirelessly with control from a simple Android or iOS app. It enables YSP-2700 users to effortlessly stream music from mobile devices and computers, as well as from services such as Pandora, Spotify, Rhapsody and SiriusXM Internet Radio, directly to the sound bar. The YSP-2700 can be easily linked to other MusicCast speakers, AV receivers and Hi-Fi gear in other rooms, to share music sources throughout the home. 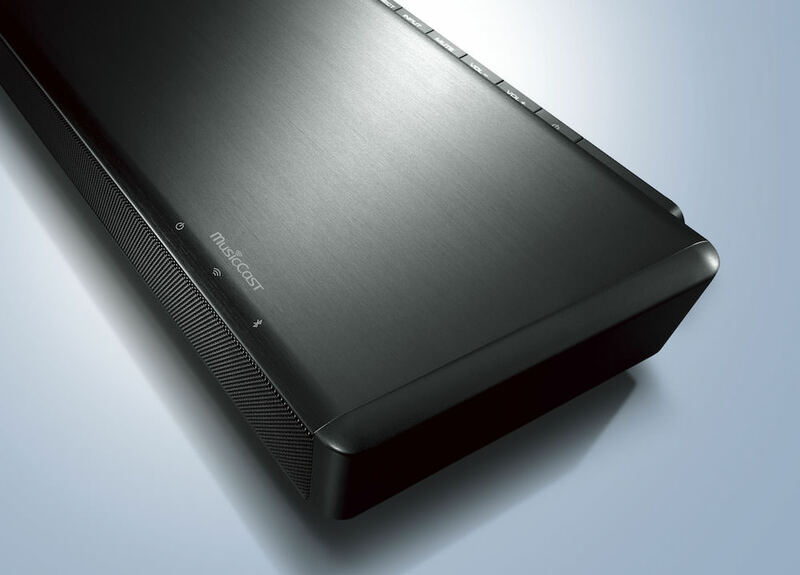 Using MusicCast, the YSP-2700 can redistribute content from multiple input sources or allow listening to the TV sound throughout the home. This unusual benefit makes it possible, for example, to transmit sound from a favorite cable TV music channel to MusicCast speakers elsewhere in the house, or listen to a sports event in multiple rooms at the same time – an especially great feature for game day parties. Further enhancing its distinction in the market, the YSP-2700 is equipped with three HDMI inputs and one output. HDMI connectivity ensures the sound bar can receive a true 5.1-channel or 7.1-channel audio source that won’t be down-converted by a TV to 2-channel stereo from the TV’s optical output. Support of HDCP 2.2 copy protection ensures signals from a new Blu-ray player, set-top box or other source will have unimpeded playback via HDMI. These HDMI input options also enable home theater enthusiasts to enjoy their favorite movies in either Dolby Digital 5.1-channel surround or Dolby True HD, which is noteworthy for its clear, lossless signal carrying up 7.1-channels. The YSP-2700 also stands out for its support of DTS surround sound technologies, including the high-quality DTS-Master Audio format that is rarely found on other sound bars. The YSP-2700 features versatile connectivity via WiFi, AirPlay and Spotify Connect, as well as Bluetooth streaming either into or out of the sound bar, making it easy to listen in privacy with Bluetooth headphones, or enjoy the audio from the big game out on the deck with a Bluetooth-connected speaker. For a grippingly realistic home theater experience, the YSP-2700 supports pass-through of pristine 4K Ultra HD resolution video at up to 60p, delivering dynamically realistic blur-free fast-action images. Yamaha’s IntelliBeam auto calibration system makes setting up the YSP-2700 easy. A supplied microphone helps to measure room acoustics so the IntelliBeam circuitry can automatically set the best beam angles while optimizing the level and frequency response of each beam. The ultra-slim sound bar enclosure is constructed with a solid aluminum body and top panel with a subtle hairline-line finish that presents an elegant, refined look. The YSP-2700 measures just 37.1” (W) x 2.04” (H) x 5.62” (D), so it won’t block the image when placed in front of a TV screen. See more specifications on Yamaha’s product page. The Yamaha YSP-2700 will be available September 2016 for $1,199.95.